We call this our "practice" garden. It seems to take a lot of the pressure off when things don't go quite according to plan. We sort of got the idea from when we took the gardening class and the instructors said we should give it at least 2 years to feel like we had it figured out. During that time the ground will get prepared for best for growing and you'll learn how to take care of the plants and where the best placement is. 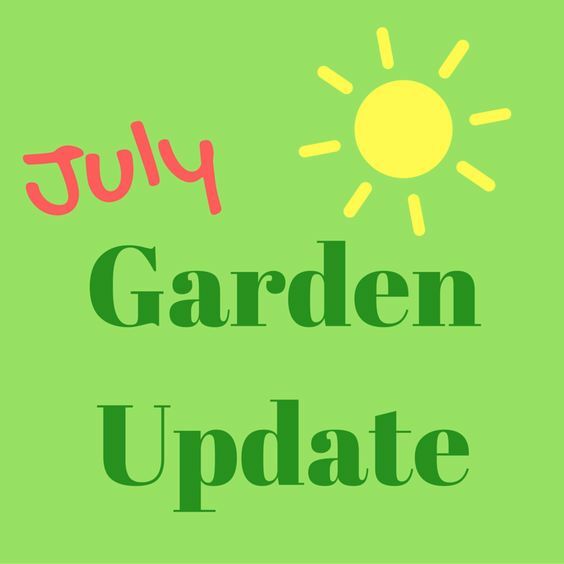 I first posted about our garden in May and everything looks so small in those photos! Since that post we have had some some successes and some failures in growing items. 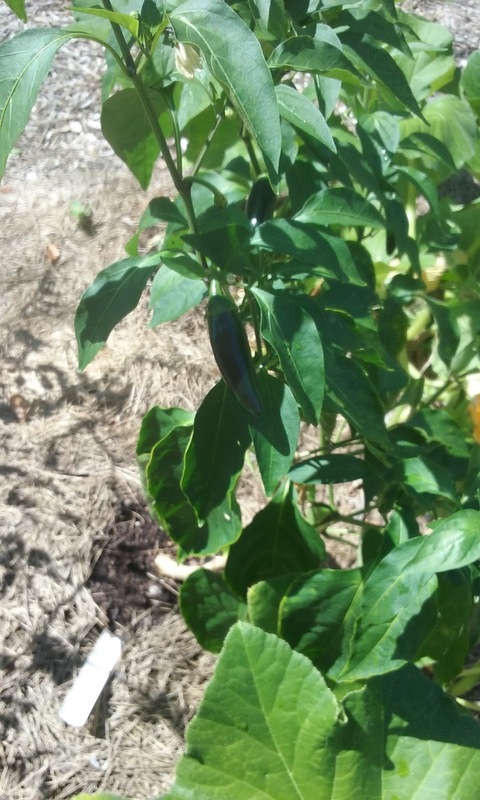 Our jalapeno plant is by far the most productive plant we have. We have made several batches of pickled jalapenos from it. This blog uses affiliate links to help pay for the blog. but the price to you remains unchanged. One of our tomato plants never took off. It is still the same size as when we planted it. We thought it was going to die, but decided to just leave it. It made one flower that didn't turn into a tomato, but that is it. It's still the same size as it was when we planted it. 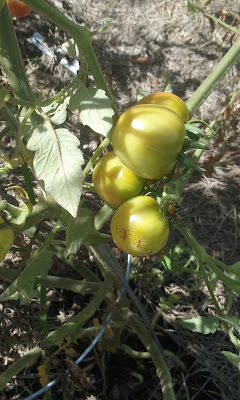 The other tomato plant we planted however, has done really well. We've harvested a significant amount of tomatoes and continue to do so, although it's production is starting to slow. Today when I went out there I found some leaf-footed stink bugs on the plant: bad news. Fortunately they are easy to get rid of. Now, be careful as leaf-footed stink bugs look very similar to Assasin bugs, but there are some important differences. Leaf footed stink bugs typically travel in packs and they have black dots on them. 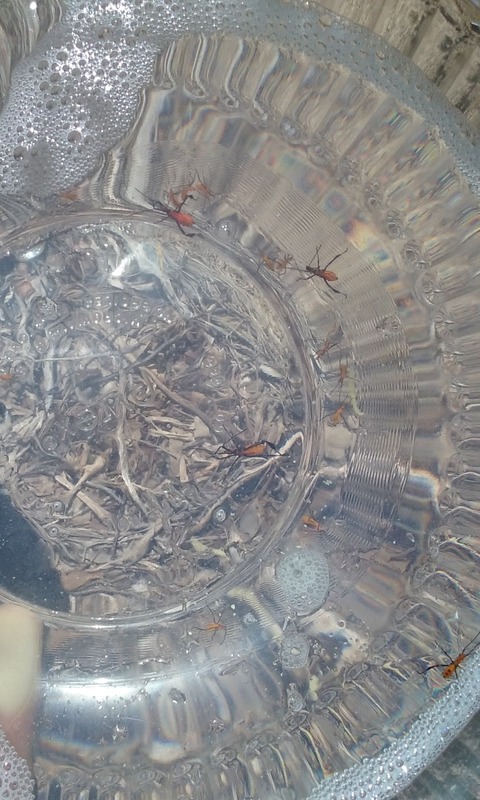 Assassin bugs, on the other hand tend to hang out by themselves and have white dots on them. Assassin bugs are beneficial because they tend to eat the bugs you don't want in the garden rather than the garden itself . Fortunately they are easy to remove. Get a bowl of water large enough to fit under the plant and put some dish soap in the bowl. 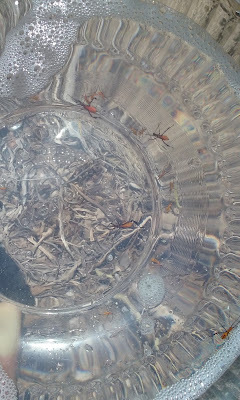 Then place the bowl under the area of the plant the that the leaf-footed stink bugs are and shake the plant. 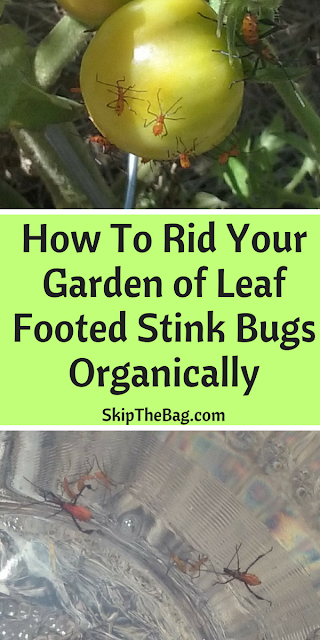 The leaf-footed stink bug's defense is to fall when they are scared so they will fall from the plant into the soapy water where they will die. It's probably the easiest bug removal method there is, certainly easier than caterpillars. We had squash vine borer which killed our yellow crookneck squash and spaghetti squash, but we were able to get one squash off of each plant before they succumbed. We had another kind of squash that the vine borer appeared to have killed, but shortly after it re-rooted and has been making a ton of leaves, but still no squash. We're just letting it do it's thing and figure if nothing else it's helping grow a root system and recruiting good bacteria and nutrients to the soil. 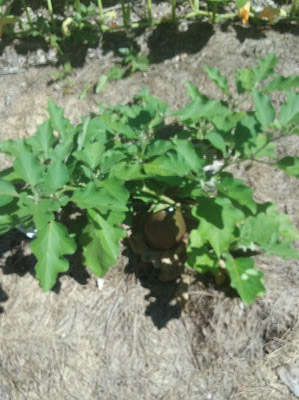 We planted eggplant later, after some items had already gotten started and one of the tomato plants grew so big that it blocks sunlight and water from one of the eggplant plants. The sheltered plant is quite a big smaller than it's two cousins we planted. However all of our eggplants have produced fruit. The eggplant Parmesan we made from the eggplant was probably the best we've ever made! 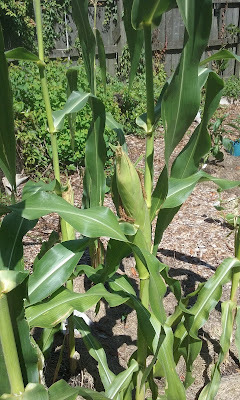 Our corn also did OK. 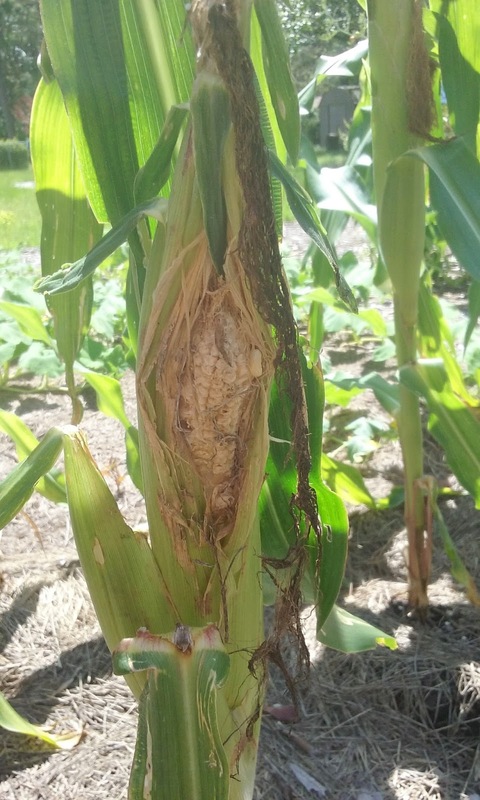 I'm happy to report that each corn stock we planted produced an ear of corn. The stocks were plagued with bugs early on, but that cleared up and they grew well. We harvested all but 2 of the ears now. Some were more pollinated than others, and some were starting to be nibbled by bugs, but we grew them! We had two ears that were starting to get eaten so we harvested them. The others still have a little bit of growing to do. One of the four rattlesnake beans struggled from the beginning, but we were able to harvest enough beans from the other 3 plants to make a side dish. Yep, that's what all our time and effort produced: a single side dish. That's why we keep calling it our practice garden. We did learn some lessons though that will help us next time. We should have planted it with a tomato cage from the beginning. We added the cage after they were already starting to climb and they all climbed up the same side of the cage rather than all around the cage. So our major lessons learned were to make sure we placed plants according to height so that they all get enough sun and water. We also learned we should plant multiples of plants, so we can at least get some product even if one dies or doesn't thrive. The Florida Panhandle area is wacky in terms of weather and growing seasons, we are just about ready to start preparing for our fall season. This fall season tends to be a very productive time. I can't wait to have all 4 garden beds planted with delicious food! Nice garden! I'm jealous of your eggplants. I've tried a few times and managed to kill the plant every time!